Endorsed by Coeliac Australia and Coeliac New Zealand. Outback Harvest is owned and operated by the McNaul family, and their quality teff is grown on the family farm in the southern Riverina of NSW, making it 100% Australian owned and locally grown. Providing paddock to plate products, this innovative company reinvigorates the personal connection between the origins of food produced by farmers, and the people that consume them. Traditionally an ancient, native Ethiopean grain, Teff is often described as ‘the new Quinoa’. It's packed full of nutrition, and regarded as a super food. Being low FODMAP and low GI, it’s higher in protein than wheat, high in iron and calcium, and contains all eight essential amino acids. It also has more calcium, fibre, zinc and thiamine than quinoa, and is good for gut health. Teff is a versatile staple, equally suitable for breakfast, lunch or dinner. Great for burger patties, cakes, muffins, salads or as a binding agent for home-made muesli bars. 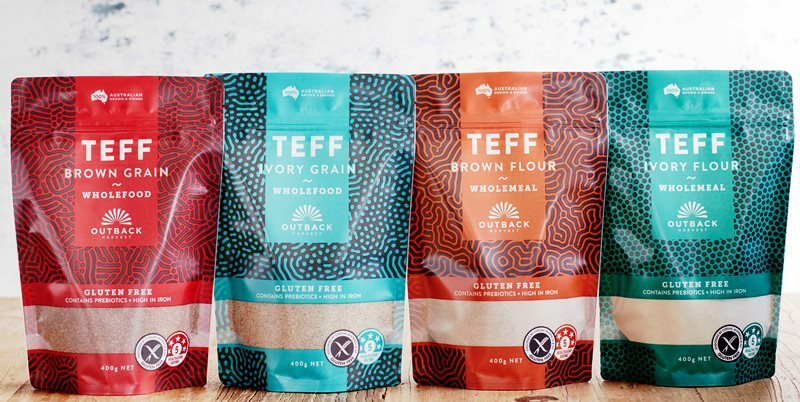 Not quite sure how to cook with teff? Find some tasty sweet and savoury recipes here! Brown Teff Flour (400g), Brown Teff Grain (400g), Ivory Teff Flour (400g), and Ivory Teff Grain (400g). Wholesale and bulk products are also available, along with wholesale enquiries. Contact through the enquiry form, or email getintouch@outbackharvest.com.au.